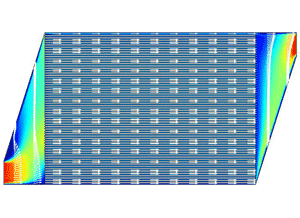 How must fuel cell cooling channels be designed to optimize heat transfer and minimize pressure loss? Fuel cells are cooled via a system of channels contained within the cell stack. The coolant heats up, thereby absorbing waste heat from the fuel cell. High pressure loss occurs across the length of the cooling lines due to the very small diameter of the individual cooling channels. This pressure loss must be overcome by using extra pipes. Oversizing the pumps incurs additional costs, not only in the form of higher investment amounts but also with increased ongoing energy costs. On the other hand, undersizing results in insufficient cooling performance leading to impermissible rises in temperature and the subsequent drying out of the stack. An additional challenge involved the client’s reluctance to provide reliable information concerning the amount of pressure loss. Therefore, the aim was to provide a dimensioning that was as precise as possible and was adapted to the requirements as well as the operating points. Thanks to these statements, our customer could approach their supplier in a focused and qualified manner. This enabled them to work together to optimize the areas that were unfavorable to the flow in such a way that heat transfer could be improved at the same time as minimizing pressure loss.